President Trump traveled to Dover Air Force Base in Delaware on Saturday to meet with the families of four Americans killed last week in a terrorist attack in Syria. After spending time with the victims’ families, the president participated in the dignified transfer ceremony of Scott Wirtz, a contractor who was killed in the deadly bomb blast. In a somber moment, the president walked on board a C-17 aircraft that held the transfer case, draped in an American flag. Inside, a chaplain led a prayer. 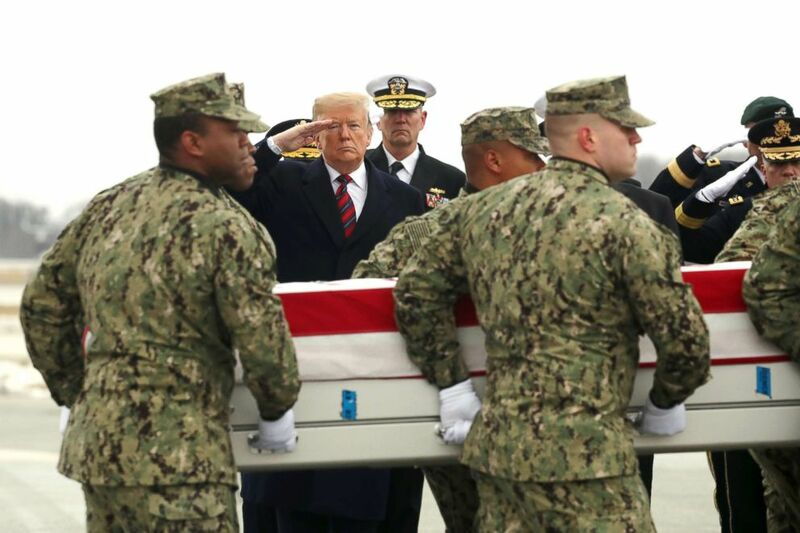 The president, who was joined by Secretary of State Mike Pompeo and acting Secretary of Defense Shanahan, stepped off the plane and stood silently in formation, saluting the case as it was carried to a transfer vehicle by the Navy Ceremonial Team. A U.S. Navy carry team moves a transfer case containing the remains of Scott A. Wirtz at Dover Air Force Base, Del., Jan. 19, 2019. 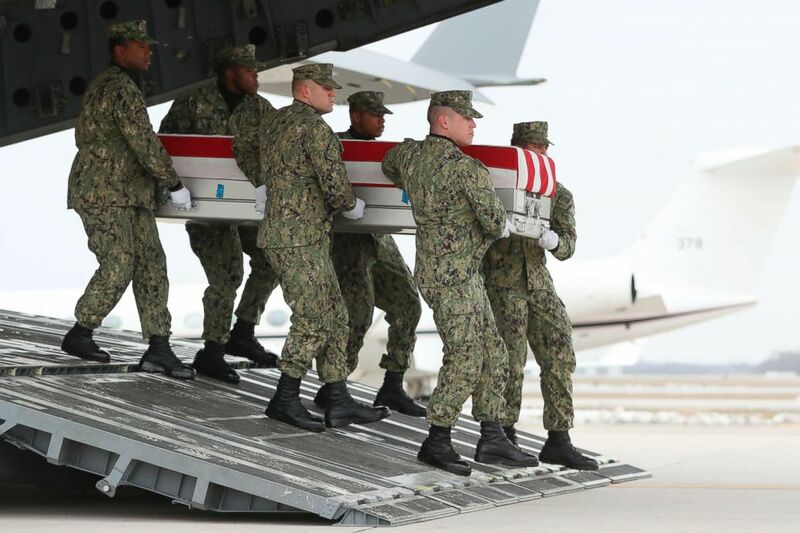 A U.S. Navy carry team moves a transfer case containing the remains of Scott A. Wirtz past President Donald Trump and the official party on Jan. 19, 2019, at Dover Air Force Base, Delaware. 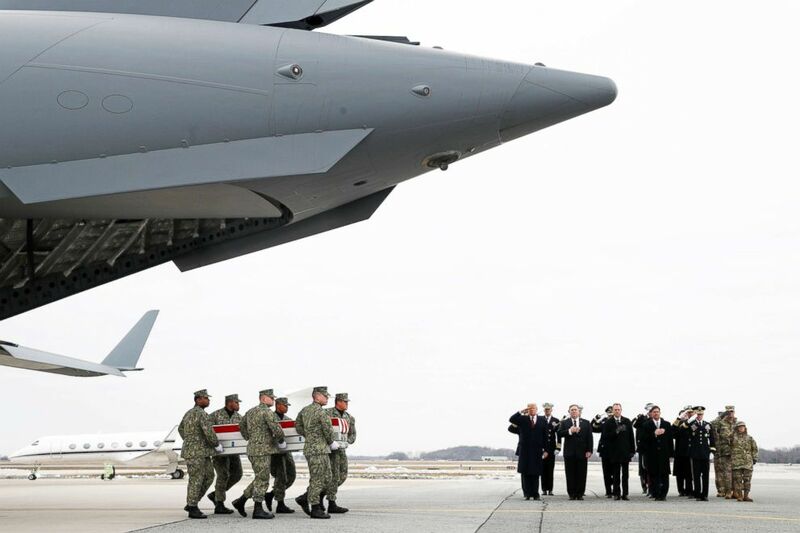 President Donald Trump salutes as a military carry team moves the transfer case containing the remains of Scott A. Wirtz during a dignified transfer at Dover Air Force Base in Dover, Del., Jan 19, 2019. “I think it is the toughest thing I have to do. When I’m going to meet relatives of some of our great, great heroes that have fallen, I think it might be the toughest thing I have to do as president,” Trump said. Wednesday’s attack in Manbij was the deadliest for the U.S. military since troops went into Syria. ISIS claimed responsibility for the attack. Last month Trump declared the U.S. would withdraw troops from Syria. He added that killing members of ISIS may be inadvertently helping some countries, including Russia, Iran and Syria. “At some point, you want to bring our people back home,” he said of troops in Syria. At the Pentagon on Thursday, Trump expressed his condolences for the families of the four Americans. “I want to take a moment to express my deepest condolences to the families of the brave American heroes who laid down their lives yesterday in selfless service to our nation,” Trump said. “We never forget their noble and immortal sacrifice,” he added. The Department of Defense has identified three of the four Americans killed. They are Army Chief Warrant Officer Jonathan Farmer 37, of Boynton Beach, Florida; Navy Chief Cryptologic Technician Shannon M. Kent, 35, of upstate New York; and DOD civilian Scott A. Wirtz of St. Louis, Missouri. 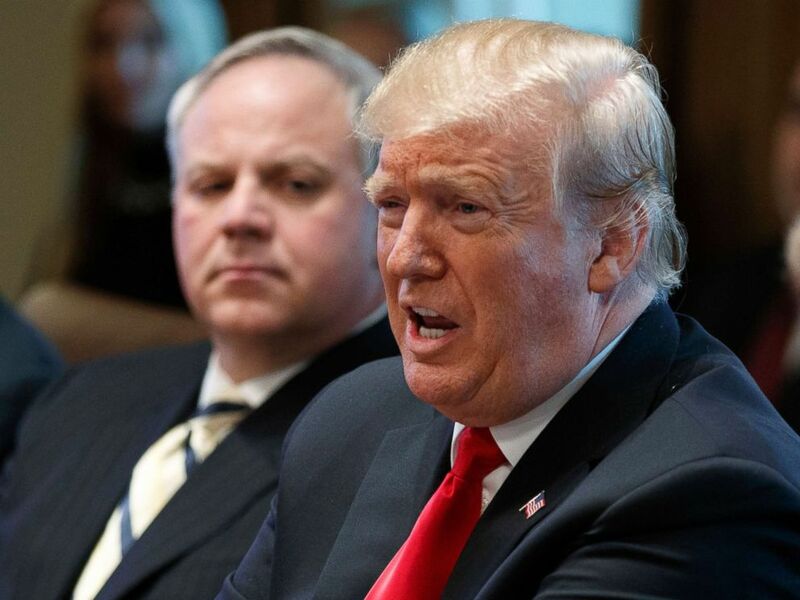 The president is also mired in a month-long stalemate over funding for his proposed wall along the U.S.-Mexico border. More than 800,000 federal workers are on furlough or working without pay as part of a partial government shutdown.